Coloressence Eye Liner Pencil - Dark Green + Free Sharpner on India's online beauty store Nykaa & get discounts and COD. Often wonder how or where to get a product that can aid you in getting the desired attractive look? Well, worry no more as Coloressence eye and Lip Liner Pencil is ultimate solution for your beauty needs. Enriched with high quality ingredients this is an ideal pencil for every woman. Easy application helps to make your eyes and lips look beautiful. Rich color highlights your eyes and gives clear outline to lips. It can be used on regular basis as it has long staying power. Silky soft texture gives enhanced look to your eyes and lips. Additional Information : Coloressence is a well-known make-up and beauty brand in India. It is part of Nature?s Essence brand which provides women trendy and affordable beauty products. Coloressence Eye and Lip Liner Pencil is safe, dual purpose pencil which is available in four shades. Explore the entire range of Eyeliner available on Nykaa. 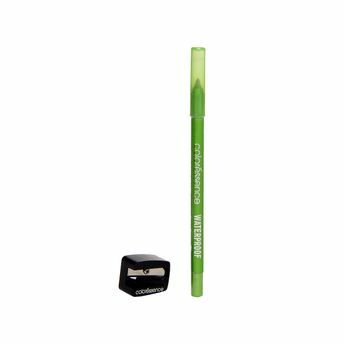 Shop more Coloressence products here.You can browse through the complete world of Coloressence Eyeliner .